Lindsay Piggott began dancing and competing at the grand age of three! She was enrolled at the highly competitive and famous studio, “Shelley’s Dance” in Edmonton Alberta. Her training saw her completion all levels of jazz examination and tap examinations ballet training, and completion of Royal Academy Ballet examinations were mandatory, and Lindsay excelled. After auditioning, Lindsay was readily accepted into the Edmonton School of Ballet. She opted, however, to focus on highland dancing. Her talent drew her to competitions throughout BC and Alberta, and her successes prompted invitations to both Tokyo and Scotland. 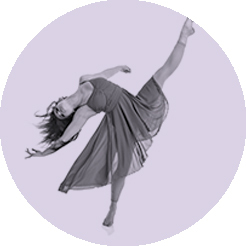 In 1997, Lindsay moved to Salmon Arm and began teaching for Just for Kicks Dance Studio. She consistently choreographs winning numbers and solos for our local dancers. She has been mentoring under Mrs. Sonja Barton Woods working along side her in our childrens’ ballet program. She is known for her advanced tapping methods and technical approach to teaching. When we asked Lindsay what she likes best about the studio, she praises the atmosphere where students dance from the heart. Lindsay Piggott teaches from the heart. What more could we ask for our children, than such an instructor.